Are you like me, at a loss for words to describe an “Art Gown” that is its own Fairy Tale? There was a beautiful young girl named Virginia who lived in the Empire of Amore. Unfortunately, she was very poor, a seamstress for the wealthy merchants of the Kingdom. The Emperor demanded his son, Prince Will, marry. He decreed a holiday with a Royal procession throughout the Empire. All “Virgins” of marrying age were to don their prettiest gowns & attend. Alas, poor Virginia had no gown, but owned some yardage of thin taffeta, the color not in fashion. 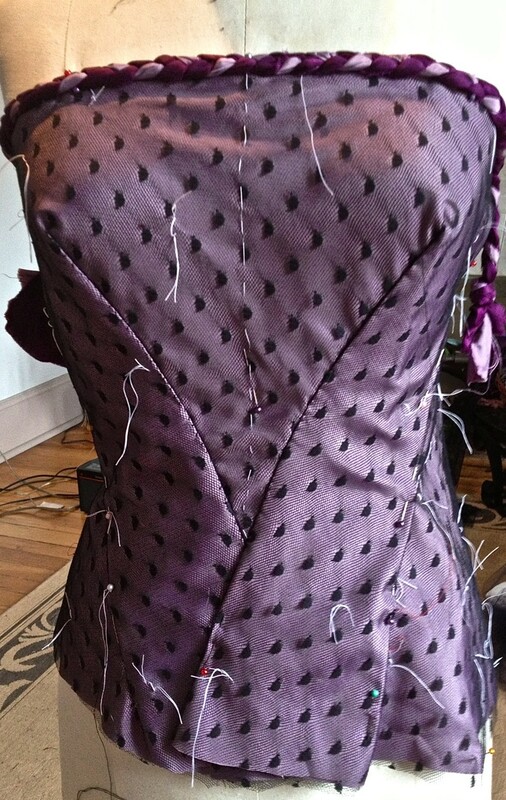 Virginia would sew a gown, but it would be very plain. She had no lace nor gems to decorate it with. All she had was a modest piece of net, a length of ratty marabou & colorful scraps of silks from her rich clients. Using “Tailor Tacks” she overlaid the net best she could. 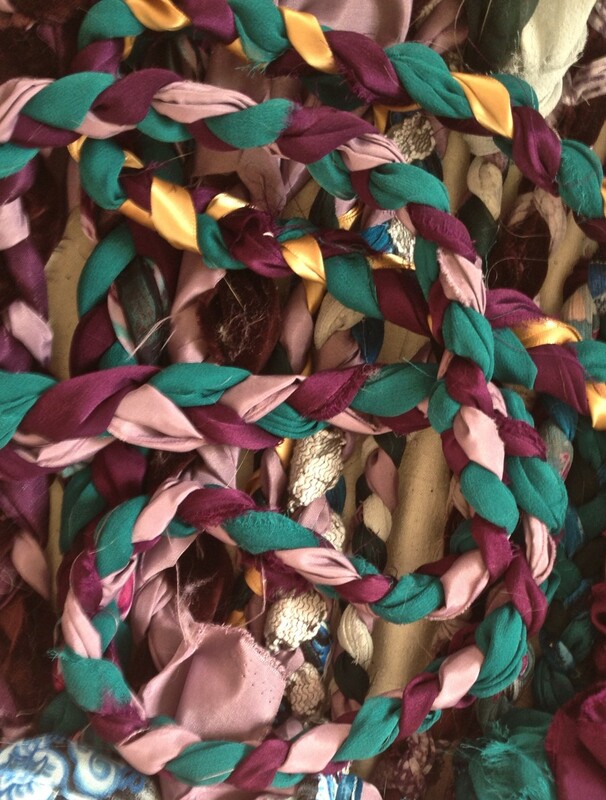 Virginia then decided to make the scraps into an luxurious abundance of braided trim. 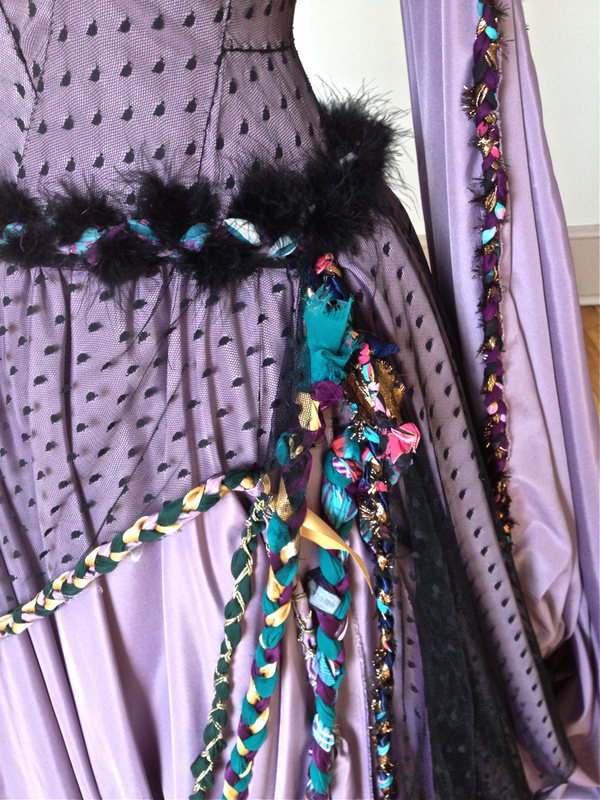 She braided for many days and many nights then creatively attached the silk braids to the gown. When it was finished, her gown was far more beautiful than any of the bejeweled and otherwise overly embellished “Gowns of the Empire”. On the day of the event, Virginia took her place along the procession route with hundreds of other girls in gowns. As the parade moved past her, Prince Will was smitten with Virginia’s beauty and the uniqueness of her gown. He took her in his arms, and asked her to be his future Empress d’Amore. The Emperor announced to the cheering crowd that Prince Will had chosen his Virgin bride. “Oh dear!” cried Virginia, “I’m not a virgin, but my name is Virginia.” The Emperor’s men tore her from the Prince’s arms. 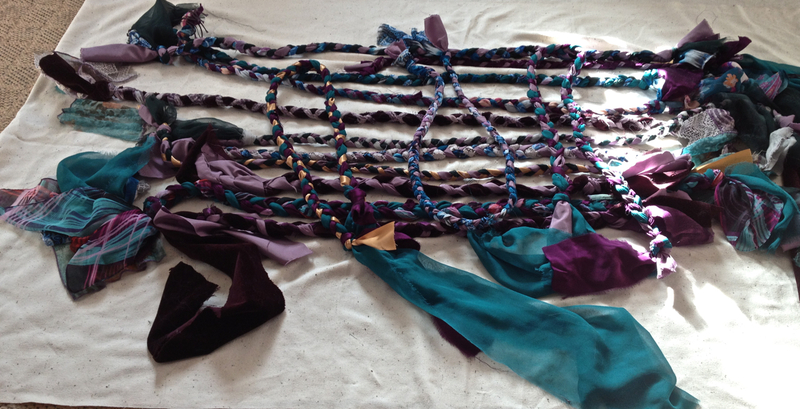 All he was left with was a hand full of colorful silk braids. Prince Will denounced his title, and set out on his white steed to find his beloved Virginia. He wore the colorful silk braids around his neck, as he wandered the Empire. When Will learned of her lofty prison. He took the braids from his neck & made a rope. A dove took the end of the silk rope, and flew up to Virginia’s window. Recognizing the braids, she threw open the sash and the dove flew in. Using the rope, Virgina climbed down from the tower. With his Love in his arms, Will galloped away on his strong white steed, as the people cheered. The Emperor died, unloved and lonely. Due to the the people’s love, Will was made Emperor, and Virginia became Empress. Don’t mess with love! It has a Will of its own, and being a Virgin has nothing to do with it. 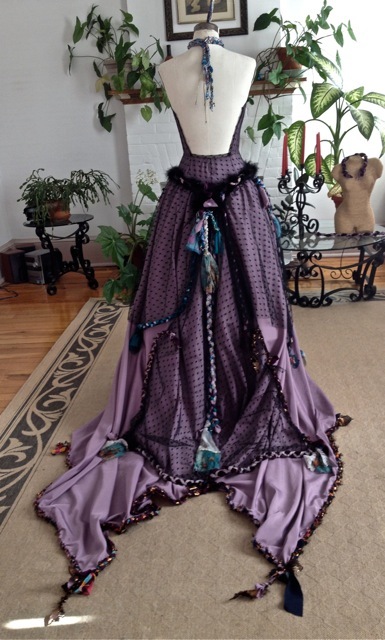 I absolutely love this very unique FaerieTale Gown! and the story gave it a life all its own…. with Happily Ever After endings of beginnings.. The dress is absolutely gorgeous! Your creation is very elegant and refined! Early morning. Virginia rubbed the sleep from her eyes. She gasped with delight. Her gown, her beautiful, shimmering gown took her breath away. Then she read the fairy tale. Magic in every word. The best part – “they lived happily ever after”. How can one not believe in magic when amongst the millions of souls wandering the blog world – two people meet and connect in a very special unique way. A friendship forged with glittering silver bands stretching across the miles. It is truly magic for I can step into Resa’s world and she into mine. Oh Virginia, you are a very lovely and inspiring person. Empress d’Amore was a joy to create, and who else could have inspired me to wrap it all up in a Fairytale! Only you, my magic friend! If there is any doubt in your mind there is magic in this world read this amazing blog. 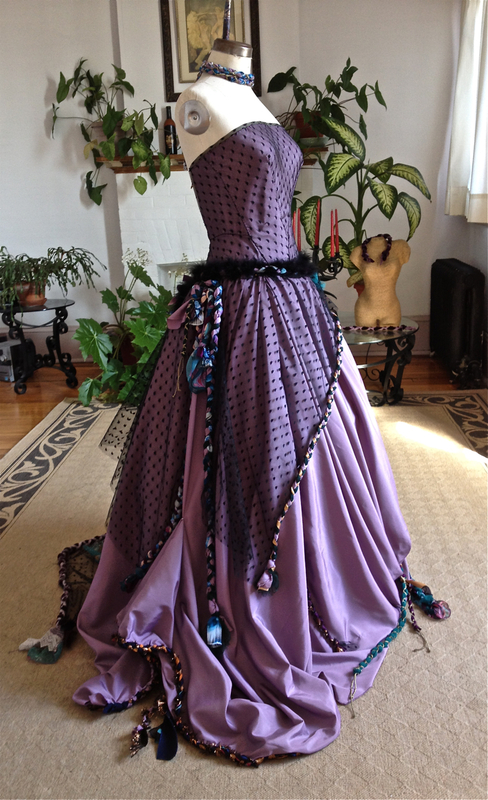 The dresses my dear Resa creates are made of dreams. 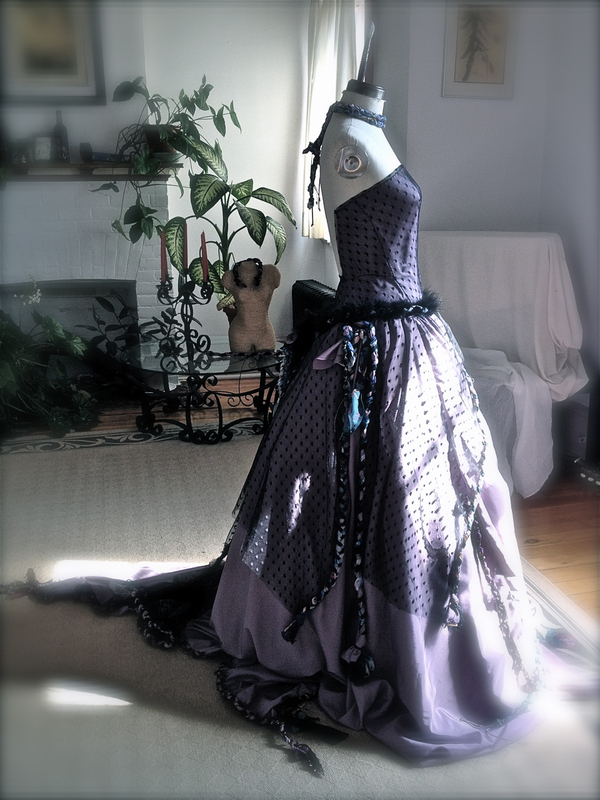 She has honoured me with this gorgeous gown and the fairy tale it inspired. sounds like a – and they lived happily ever after until the end of their days, and their nights were especially spicy. Thanks Cindy! I wonder if a big star would wear recycled scraps as I’ve done here! One thing is for sure, there is only one of each gown! They would actually be wearing Art! Another beautiful creation. What a gift you have! Aww, thank you! I really get a lot out of the process of creating beauty!! No comment. My doll collection is way too big. C’est le premier conte de fées que j’ai jamais écrit. YAY! Dear FGS Robyn, I’m absolutely thrilled that you adore the Fairytale. 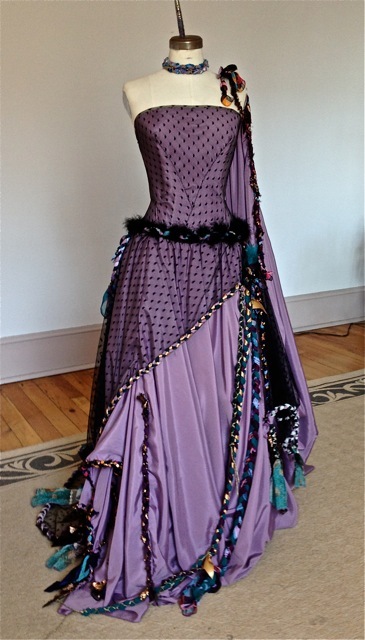 It was a bit of a departure, and in the end a whole lot of fun using an Art Gown to tell a tale! What a fab idea to have a Spring Mantra. “DON’T MESS WITH LOVE” will be mine, too! yes – the story was so much fun Resa! I keep thinking about it and smiling! Oh Robyn, You are very sweet to tell me that! She is gorgeous. I do love her lines and all her “gown” elements, but then I love all of my girls! Oh I had one idea, but not the place to do it. 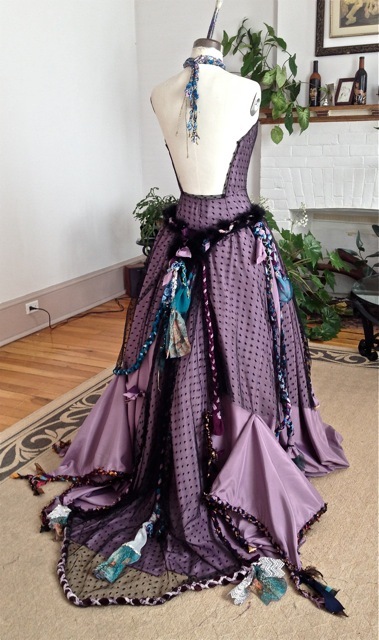 Recycling plastic table cloths into a full gown with pocketed tiers. I would fill the tiers with mud and plant flowers from seedlings. Then I would have a living flower gown. Well, that is a dream for the future. I just love how you encourage my creative juices, and I hope I do the same for you! 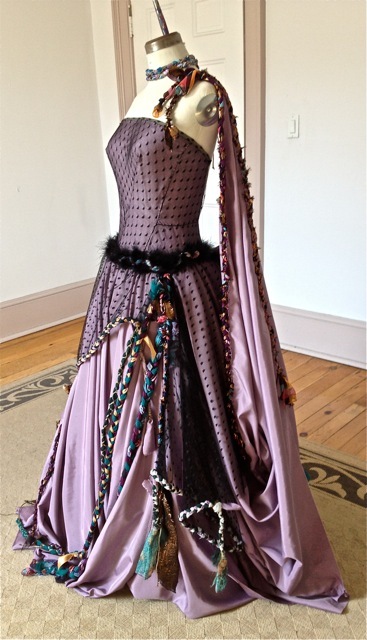 Oh my, Resa; you have excelled yourself in creativity both in fashion and in word. Love has won the day, yet again! I do love love. I always have. I’m so happy you enjoyed my Fairytale and the Art Gown! It was actually quite fun to write a tale to go with a gown. “lol” Will I ever grow all the way up? You are very lovely to visit, and thank you for your wonderful comment. I have to go make dinner, and will be by to visit your blog later! Thank you so much. Being creative is a satisfying thing. Some make music, some paint, some write books or very, very unique and funny blog posts, I do gowns! Resa it’s magnificent! I think it’s my favourite. And I LOVE your story that goes with it. You are a true romantic and your gowns are the stuff of dreams, which makes you a perfect match for a fairy tale. How did I ever, ever miss this comment! The fae are present in your midst! Yay! I’m so glad you liked the story! I really think the Gown looks like a Fairy Tale, so it just happened. “lol” I have the same praise challenge with your posts! And funny the link to Butterfingers… she’s “friends” with Celi over at the Kitchen’s Garden- another blog I like very much- great writing on a farm. I’m working on ideas, but need some more info, and want to throw an idea or 2 at you..
I’ll email you at your Google address which is public on your Gravatar. It would be my next Art Gown, or the one after. You have left some lovely and magical words for me here. Wow Resa! What a piece of art this is. I love it! Baby steps are cool! 😎 and you’ve been busy, no doubt! 🙂 Thank you! The Art Gowns are my treasures! I am so glad you found one enchanting… well actually you wrote lovely! 🙂 “lol” Thank you! Thank ou! Love back to you! Gorgeous gown. I love the rapunzel elements of your story. My son has a followup question. What do you do with your gowns? Do you have a special closet? They are magical and gorgeous. I like that each one has it’s theme. Definitely each Art Gown has a theme, they are each a girl of mine. 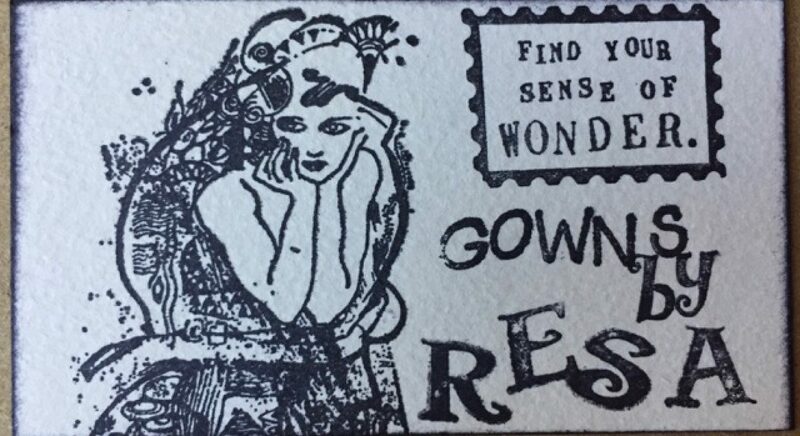 What do I do with my gowns? Since the last 4, I have them in special garment bags. They live upstairs, wherever I can find room. Most of the others are in 2 or 3 pieces each in a plastic storage box in the basement. There are at least 6 Art gowns that can never be restored. You need a portrait gallery with dresses instead of ancestors. I can see them all, lined up. Aw, thank you. I can see them, in a large gallery, gathered together as family, displaying the evolution of your style. You are truly special, too. I told my daughter what you said about sending Titania, and her eyes lit up. 🙂 We don’t have any definite plans, just a daughter’s greed and a son’s desire to understand the adult world. And art.